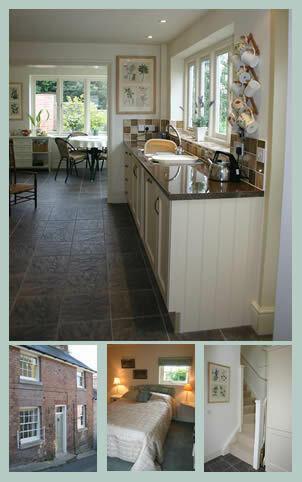 Tudor Cottage is for those who seek a special place to stay in South Shropshire. In the midst of the historic market town of Bishop’s Castle Tudor Cottage offers self catering accommodation for up to five people - the ideal place from which to enjoy all the area has to offer: eating places, shops and pubs are only the shortest stroll away, whilst the beautiful private garden and terrace has views across the town to the hills beyond. The property has recently been beautifully renovated to a high specification, and has not lost any of it's original character. The traditional red brick and stone facade and original sash windows have been combined with modern appliances, crisp white bed linen and English antiquities to provide a beautiful space with all of the creature comforts. The house is spacious with a large kitchen/breakfast room, sitting room, single bedroom and shower room with WC and basin on the ground floor and two double bedrooms, one with en-suite bath room on the first floor. Tudor Cottage has the benefit of oil fired central heating. During the colder months a basket of logs is provided to enable guests to enjoy an open fire in the sitting room. Perfect for short winter breaks.